1. It was time consuming for the user to write all of this information. 2. It was difficult to read their hand writing when it came time to search/find a lost book/volume. 3. As a result of the above, it was difficult to get users to consistently fill out the information. 4. When we needed to find a book that hadn’t been properly checked out, we had to send an email to everyone and then start checking roughly 200 offices. Per Ms. Jaime Christopher “there had to be a better way”! 1. Tag all books/volumes, documents, paperwork with barcode/RFID labels. 2. Users can check out books quickly and easily online. 3. If a book/volume has been properly checked out, they can easily find who has it with a couple of key strokes. 4. If it hasn’t been properly checked out, we track it down with the PDA (Geiger type functionality, whereby user gets an audible as you get closer to the Tagged book/volume, thus saving a tremendous amount of time let alone the inconvenience of having someone go through your desk looking for the items. 5. Furthermore as result of a sophisticated audit trail within the IntelliView™ system, clients can now establish various metrics such as “what volumes/books are consistently being check out vs. those that are not”. 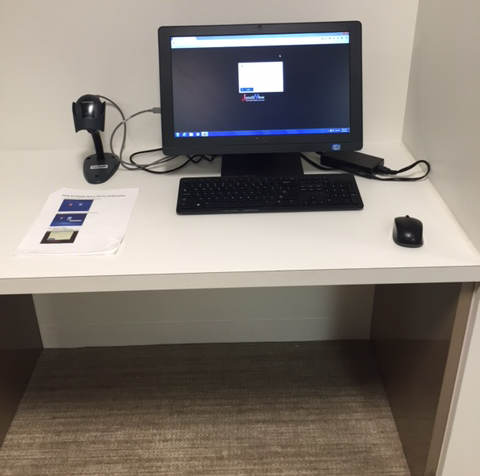 Check-in/Check-out document tracking station located in the Smith Anderson Law Library. The station is used to check in and/or check out literature that has been tagged with RFID labels.